I ventured into the basement Tuesday evening and made my way to a shelf filled with old-school VHS videotapes. In the second row was a white case. 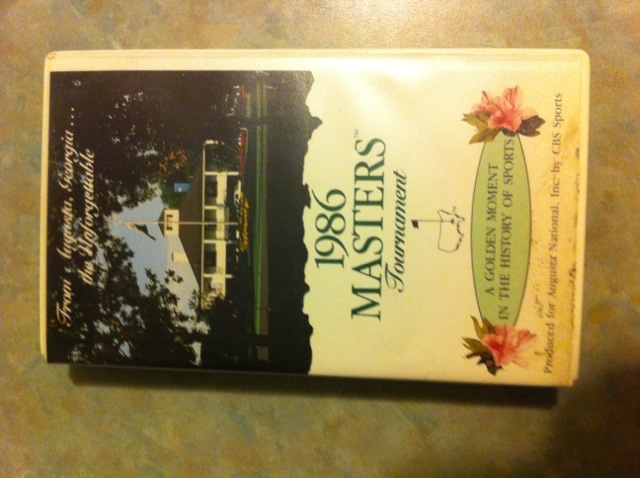 The front of the case (right) is a picture of the Augusta National clubhouse. I figured that 25 years after Jack Nicklaus’ improbable Masters victory, it was time to revisit it. It has been years since I watched this tape — or any thing on VHS — but was still amazing to watch. Basically the tape shows every shot Nicklaus made on the final nine holes on Sunday. There were the two great putts on 10 and 11, the bogey on 12. There was the eagle on 15, the great tee shot/near ace on 16 and Verne Lundquist saying, “Maybe … Yes sir!” when Jack rolled in the birdie on 17 with his Response ZT putter (also known as the biggest putter ever used). On Tuesday, Jack talked about that day in the Augusta press room. Here is the Atlanta Journal-Constitution version of the story. While much has been written about that day, it’s place in golf history, and the like, I have a few more observations after spending a little time back in the mid-80s. – I can’t believe Norman hit two balls as far left (the approach into 10) and as far right (the second shot into 18 that waaaay foul) in the span of only nine holes. – I had no recollection that Seve was repping Nike back in the day. He was Tiger before Tiger was Mr. Swoosh. – On 12, Jack hit 6-iron from 162 yards. Yes, 6-iron. What would Bubba Watson hit from 162 yards today? Pitching wedge? Gap wedge? Think technology has changed the game. – There were these amazing sightings during early parts of the tape: T.C. Chen, somebody typing on a typewriter, a fan sitting on the ground with metal spikes in his shoes showing. – There was film of players actually taking their own clubs out of a car. Tom Kite actually was shown carrying his clubs. Staff bags were also about half the size they are now. – There were persimmon woods. Lots of them. Not sure I saw even an old-school Taylor Made metal wood anywhere. – Gary McCord and Ben Wright are also both on the broadcast. Very bizarre. – In the 25 years that have passed, has there been another player that won a major with, essentially, a gimmick putter? While based on a fairly classic putter design, that Response ZT was enormous. It was the putter version of clown shoes. While I care a little bit about golf (OK, a lot a bit), I can’t tell you exactly where I watched Sunday afternoon’s action. I was in ninth grade and I kind of recall that that weekend was the first weekend of the year that the Willmar Golf Club (now Eagle Creek Golf Club) was open for play. I kind of remember playing part of that afternoon and that it was cold, but that’s about it. I would guess that I watched some of the back nine in the pro shop, but I’m not certain. I certainly didn’t think I was watching history. While I don’t have the recollection of the day, it was fun to go back in time and relive history. It was an amazing performance then and it is still amazing. Watched it on the couch at home. That back nine was incredible, the eagle was astounding. Evergreen.